I was doing some map research yesterday, and the trip advisor utility on Google Maps caught my eye. 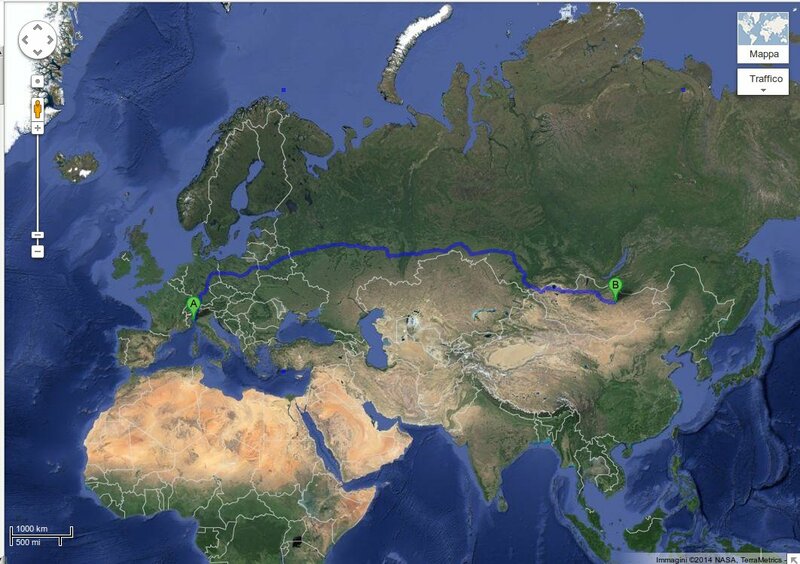 So I calculated – better, I had the software calculate and draw the route from Castelnuovo Belbo, Italy, and Ulaan Bataar, Mongolia. And the software planned my trip – mentioning passingly that it does include some roads that might be interrupted, and it will require me to cross a few national borders. My very own, on-demand Silk Road, if you will. Google claims I can drive the 8.909 kilometers between my home and the Ulaan Bataar city limits in 107 hours. Alas, no public transport seems to cover distance: I can’t get to Ulaan Bataar by bus. But I could hike it, saving almost 400 kms, in 1.722 hours. That’s 72 solid days of uninterrupted walking or – limiting myself to 8-hours legs – 215 days on the road. Apart from the silliness of it all, I find the road directions and descriptions quite intriguing from – you guessed it – a writer’s point of view. I can even get a street view of the place. Going there in person as part of “documenting my novel” wuld be much better, but this is certainly cheaper. Categories: Armchair adventuring | Tags: Castelnuovo Belbo, Google Maps, Mongolia, Ulan Bator | Permalink.